New items are available in all of the galleries. Check 'em out! It's been a rough couple of years for me personally, but things have finally settled down, and I'm looking forward to all the things I can do next year! My first con will be ConDFW, February 15-17. This is ConDFW's final year, so please show up and help them go out with a bang! I'll be on programming and will have a table with some mew merchandise. Speaking of new merchandise, I've spent the last part of the year planning new items I can sell. The first new items will be laser engraved shot glasses! I'm sourcing geeky designs and sayings for them. 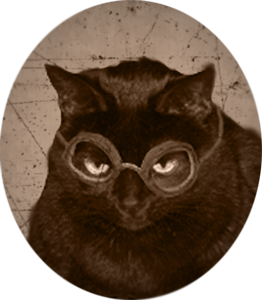 Follow Steam Cat on Facebook for more information. I have added one new programming item to the Bookings page as well. If you would like me to attend your convention, please drop me a line. I'm also looking for places and shows in Texas where I can sell, even if I'm not on programming. If you would like to see Steam Cat a con near you, please send me some details so I can see about getting a table. I'll leave you with our family Catmas card. That's Midnight, the cat in the logo. 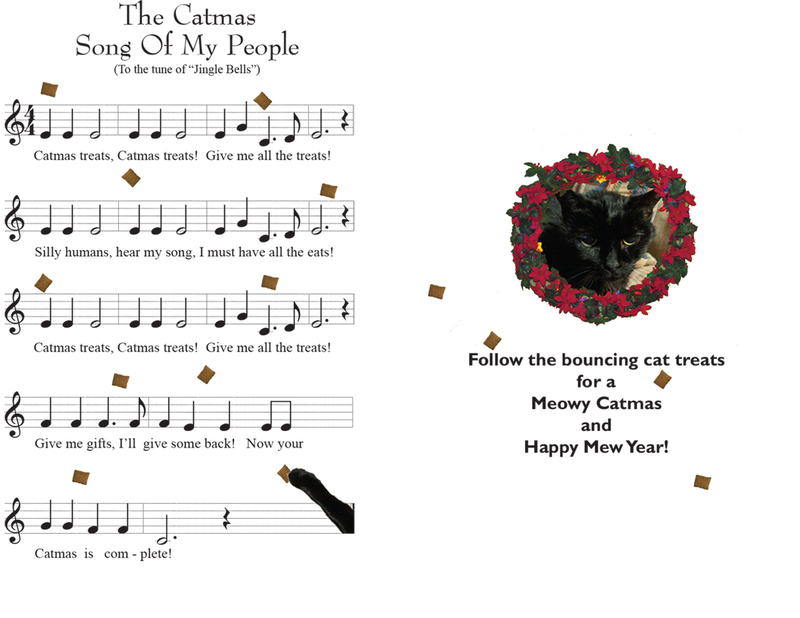 She's now eighteen, and still plows through the cat treats, which was the inspiration for this year's card. I had a brain freeze and totally forgot to put my SoonerCon schedule on the site. Sorry about that. Thank you again to SoonerCon for having us back, and thank you all for being such a great audience. You had some very good questions, and I hope we answered them to your satisfaction. Is there anything you would like to see in future presentations? Drop me a line at info - at - SteamCat - dot -net. Steam Cat will be at ConDFW THIS weekend! I'll have some new items and a few old favorites. Also, I'll be doing a workshop on blocking buckram at 11 AM on Saturday. If' you're planning to attend, please mark "Going" on the Facebook invitation page. I want to ensure I have enough supplies. I'll be bringing everything, but you need to supply your own Styrofoam wig head. Why? You'll be taking that back home with freshly-blocked buckram along with instructions on how to complete your project. And yes, I'll even supply a plastic bag for you to put it in, because the buckram will still be damp. I'll be adding more shows as the year goes on. See the Events page for details. It's kind of sparse right now, but I'm working it. I'm looking at adding more tutorials and doing some live video. Do you think this would be useful? Of course, I'm going to be adding some new things to my product line. If you've been following the Steam Cat page on Facebook, you've had a bit of a preview. Any products you would like to see? Deerstalkers in more fabric choices? More light-up accessories? Let me know on the Facebook page. You don't have to be a follower to comment, but I'd be honored if you did follow. Keeping the Etsy store better stocked is also on the list. Remember, for items in stock I generally ship in 1-2 business days. I also do custom orders. Thank you again for your support and kind comments in 2017. I couldn't have done it without you. Steam Cat content Copyright 2019, Julie Barrett. Email: info-at-SteamCat-dot-net, or contact through Facebook.